At the time the post is published, the Auckland Transport board will be in the middle of their six-weekly board meeting. Here are some of the highlights from the documents available. The closed session is usually where all the juicy decisions are made. There are quite a few things on the agenda today, including an hour strategy session on governance. I wonder if that relates to the new CEO? There are a number of items up for approval/decision. It’s not clear what each of them refer however. There are only a couple of items for noting, the second one being interesting as that relates to light rail on Dominion Rd and to the airport. The business report covers a lot of areas. As usual, I’ve just listed some of the items that caught my attention. AT have a section listing all the briefings they’ve given recently to local boards on issues for each of them. I won’t list them here as they’re long but you’re interested in what you’re local board is getting briefings about, this may be of interest to you. AT and NZ Transport Agency will be commencing public engagement on the proposed Northwestern Busway in October, delayed from the original date so as to not straddle the election period. This will run for six weeks and seeks community feedback on the emerging alignment and proposed stations to improve future design and planning processes. AT will be reporting on the recently completed programme business case for the North Shore RTN, including how this relates to NZ Transport Agency plans for the Additional Waitemata Harbour Crossing. AT is setting out a way forward following recent public consultation on the Lake Road Improvements proposal, and engagement with the Devonport Takapuna Local Board continues in September. AT’s new Roads and Streets Framework is due to finalised this month. This is going to be a very important document for the future of how our urban environments. Here’s how they explain it. The draft Roads and Streets Framework was developed to balance and integrate the intended strategic and local place and movement functions of roads and streets, as well as the levels of service for all modes. Its primary purpose is to ensure integrated planning amongst AT divisions and that the ‘Place’ aspirations of Auckland Council are fully taken into account early in the planning process. AT HOP Web Rebuild – AT are still having technical issues with this and it has been delayed again. EMU 4G Tender – it sounds like should be finalised soon and would see WiFi made available on our trains. AT Mobile – AT plan to keep improving their (relatively) new mobile app. Some of the recent additions to it include “school bus routes and improved accessibility for partially sighted users.” They also say the next significant change will see HOP balances added to the app. Digital Concessions – Loading concessions on HOP cards has long been complained about. AT say they’re working on streamlined process that will undergo a “tactical business pilot with Auckland Uni for early 2018“. Journey Planner – AT have recognised their journey planner is horrible and costs them over $1 million a year in enquiries so they now plan to improve it. There is not timeframe for this though. Here are a few of the projects AT mention in the report. Ian McKinnon Cycle Route – Detailed design has been completed and AT are now getting approval to use NZTA land. Resource consent is expected this month and a construction tender is due out in October. 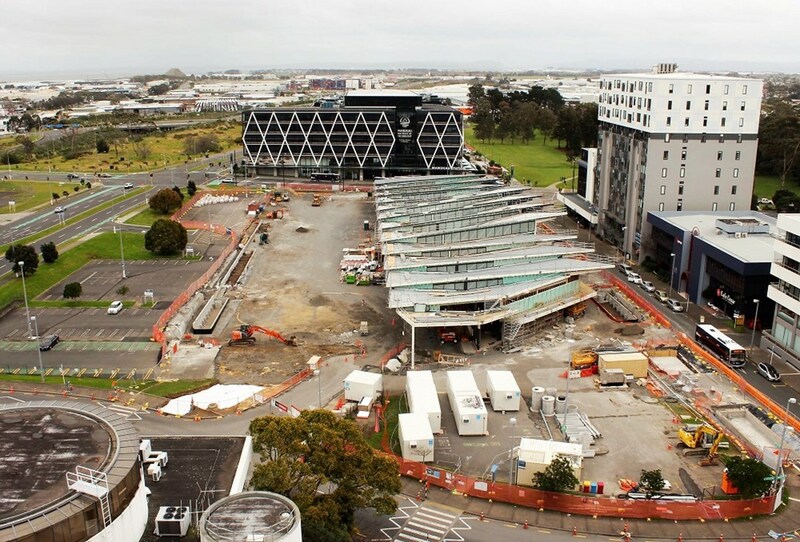 Manukau Bus Interchange – The building is now mostly watertight and they’ve started some of the fitout work. However, due to some issues the practical completion has been delayed 3-weeks. Following operational fit out and training early next year, it is expected to open to go into use in the first quarter. Panmure to Pakuranga – The consent hearing is likely to take place in December. Pakuranga to Botany (including Reeves Rd Flyover) – A contract for the design and consenting is due to be awarded in October. AT say they’ve also started some internal and external consultation with key stakeholders on the architectural concepts for the Reeves Rd Flyover. Risk Intersections (2016). Yet it goes on to say that the project was only approved after it could be shown that the upgrade wouldn’t impact traffic flow. it was agreed that the impacts to the operation of the network are within acceptable operational parameters. This decision was based on the findings from network modelling covering St Lukes interchange and a number of adjacent intersections in the study area. In South Auckland, the 380 bus service will have its frequency improved from every 30 to every 15 minutes in December, bringing it into the Frequent Transport Network and making it easier to train/bus from the city to the airport. Within the airport itself, two new “bus only” link roads will speed up buses. AT say South Auckland is showing a 3% increase in journeys (i.e. net of transfers), compared to before the new network was rolled out. Prior to the new network, trips in the south had declined for two years. In the west there has been a 2% increase in journeys which is better than their predicted stagnation or decline for the first four months following the change. Extra trains: It appears that following the election pledges on electrifying to Pukekohe, AT are re-evaluating their options. They say the NZTA has asked Kiwirail to put together a business case and confirm timing for electrification so a decision can be made on the trains after the election. March Madness 2018 – AT are already planning for the 2018 madness. This year they put on a lot of extra capacity and that seemed to deal with a lot of the issues we’d seen in the past. As part of this they note that the Mt Eden services were a stand out this year and saw a 10% increase. “Pakuranga to Botany (including Reeves Rd Flyover)” – Aghhh hope that flyover is cancelled, waste of money. Me too! Complete waste of money. Nothing in the agenda about how to spend all the money they filched from HOP customers? That princely sum is just enough to cover the city’s legal bill for dealing with the Cowie Street resident associations quixotic demands. Give it a break – it’s clear that the money has not been “filched” and to assert otherwise is just mischievous disinformation that feeds the worst anti-PT sentiment. I guess in the long term there is hope with the “AT HOP Web Rebuild” been as aspect of improving this issue. Wouldn’t their newer AT Mobile app replace the Journey Planner? – ahhh web version I guess & general back end logical handling of routes etc perhaps. I always use Google as first port of call – hard to compete with their development might…but doesn’t have prices or distinguish from school buses, not normally an issue pretty easy to figure if you want. AT Mobile journey planner doesn’t have the route/operator/mode filters like the website one, which is really annoying. It just feels so clunky. They could make the UI a lot more user friendly if they took some tips from other apps like KiwiTransit or Auckland Transit. Also the “notification” area with disruptions only ever had one disruption ever for me since I started using it… lol. Get plenty of Transdev texts about disruptions but nothing in the AT Mobile app. Extra Trains, so in light of the election promises for electrification to Pukekohe does this man the battery emus may not be ordered? This sounds like something straight out of Yes Minister, but I think it means the order is going ahead and could be adjusted when the electrification schedule is confirmed. I thought that was the case. So it really depends on the KR report and if it is feasible to install the OLE Papakura-Pukekohe by late 2019. Since this is probably unlikely then the order for bemus will proceed. I would like to comment on ‘March Madness’ on Mt Eden Road. This year, because AT has increased capacity on Mt Eden Road, things are much better. At most, I have to miss one or two buses because they were full, but this is acceptable as the buses on Mt Eden Rd are very frequent. In previous years, I would wait for about five or six buses to pass before an empty one would come. So, well done AT. What the Mt Eden Rd buses now lack is not frequency. Even the NEX does not parallel the Mt Eden Rd bus frequency, with a bus every two minutes in peak and no less than a bus every 10 minutes off peak (during weekdays). The 274/277 now need better bus lanes, and there needs to be less ‘bunching’ of buses. The bunching problem happens quite often around the Balmoral road intersection, so sometimes a two minute frequency in the mornings turns into 5 buses that come at once, and then no buses for the next 20 minutes, and then 10 buses come at once. It’s not uncommon for the bus stop outside the Langham to be filled with 274/277s at the same time. Walking from the Manukau Station to the Mall a couple o times this winter has made me reality aware of how much that walk is cld and wet. Next winter I will be able to walk through the bus station. I wonder if there is any proposal to cover more of that walk before next winter? “A part of the governance review will see a pilot on Waiheke Island (for three years). Exact details are still being worked through but indications are there will be the appointment of an ‘operations manager’ for the island and the provision of a separate budget and staff resource for planning and operational matters. It’s likely that the pilot will include development of a ten-year transport plan for the island, something that the local board has been advocating for, and specific design guidelines for infrastructure to be included as part of the AT design manual. (Apologies to Simon and Garfunkel!). Why is the North Shore new network rollout further delayed? Our consultation was before Central Auckland. Electronic HOP gating of Henderson and Otahuhu rail station was completed in August. In the first few weeks patronage recorded a +30% and +12% respectively. Wow! +30%! So you could infer that a third of all trips prior were freeloading then on what is a fairly major station!